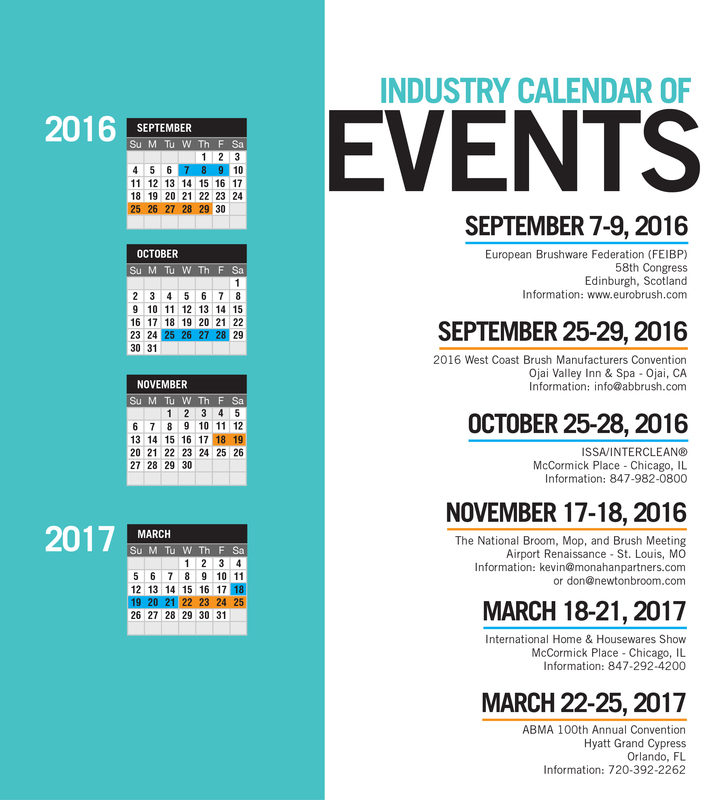 A large contingent of brush, mop, broom, squeegee and related industry suppliers and buyers are expected to attend ISSA/INTERCLEAN 2016, scheduled for October 25-28, at McCormick Place, South Hall, in Chicago, IL. The annual event will include a large exhibition hall with over 700 exhibitors, from more than 25 countries, showcasing products and services, and featuring innovations in the janitorial/sanitary industry. Also in the program line-up are three keynote speakers, as well as a revamped educational schedule, featuring more than 60 seminars, hands-on training workshops and networking events. The event’s first keynote address will be given by Former U.S. Navy SEAL Rob O’Neill on Wednesday, October 26, from 8 to 9 a.m. O’Neill is co-founder of Your Grateful Nation, an organization that provides support to members of Special Operations as they return to civilian life. He was a senior chief petty officer and a team leader in the Naval Special Development Group, known as SEAL Team Six. During his career with the armed services, O’Neill was deployed more than a dozen times, participating in more than 400 combat missions. In his presentation, he will talk about his commitment to never quit, his understanding of the benefits of being prepared, and his ability to make decisions under pressure, according to an ISSA release. He will offer advice to attendees about how they can apply and share these values within their own companies and other aspects of life. The third and final keynote address will be presented by Apple Co-Founder Steve Wozniak, who will speak Friday, October 28 from 1 to 2 p.m. 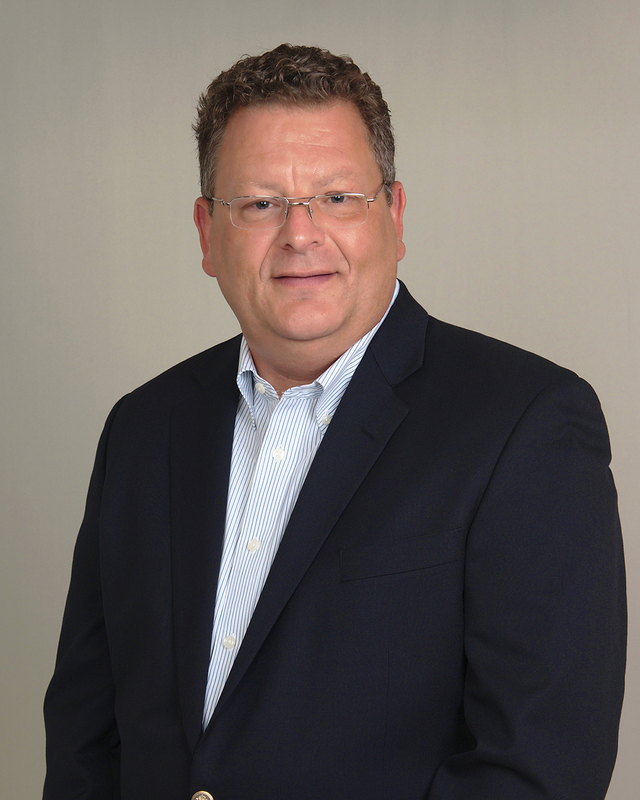 He has been a chief scientist at Primary Data, a data virtualization company. Wozniak’s keynote presentation will be an informal Q&A “chat” with ISSA Executive Director John Barrett. At noon, prior to the keynote session, Wozniak will announce the overall top winner in the ISSA Innovation Award Program. • Workshops: Half- and full-day hands-on opportunities to learn skills, such as floor and restroom care, customer service, supervisor, and auditing, many of which include certification. Visit www.issa.com to learn more. Import totals for the first five months of 2016 were up in five finished goods categories outlined: toothbrushes, hairbrushes, paint rollers, paintbrushes and upright brooms, compared to the first five months of 2015. In May 2016, six categories outlined recorded increases: brooms and brushes of vegetable material, toothbrushes, hairbrushes, shaving brushes, paint rollers and upright brooms, compared to May 2015. China sent 104,471 kilograms of hog bristle to the United States during the first five months of 2016. The average price per kilogram for May 2016 was $18.31, up 16 percent from the average price per kilogram for May 2015 of $15.72. The average price per kilogram for the first five months of 2016 was $20.96, up 27 percent from the average price per kilogram of $16.50 for the first five months of 2015. The import total of broom and mop handles during May 2016 was 1.6 million, up 14 percent from 1.4 million for May 2015. During the first five months of 2016, 6.6 million broom and mop handles were imported, down 7 percent from 7.1 million for the first five months of 2015. During the first five months of 2016, the United States received 3.4 million broom and mop handles from Brazil and 2 million from Honduras. The average price per handle for May 2016 was 95 cents, down 10 percent from the average for May 2015 of $1.05. The average price for the first five months of 2016 was 94 cents, down 2 percent from 96 cents for the first five months of 2015. May 2016 imports of brush backs totaled 633,262, down 2 percent from 648,847 for May 2015. During the first five months of 2016, 3.2 million brush backs were imported, up 28 percent from 2.5 million for the first five months of 2015. Canada sent 1.5 million brush backs to the United States during the first five months of 2016, while Sri Lanka shipped 1.4 million. The average price per brush back was 45 cents during May 2016, up 5 percent from 43 cents for May 2015. 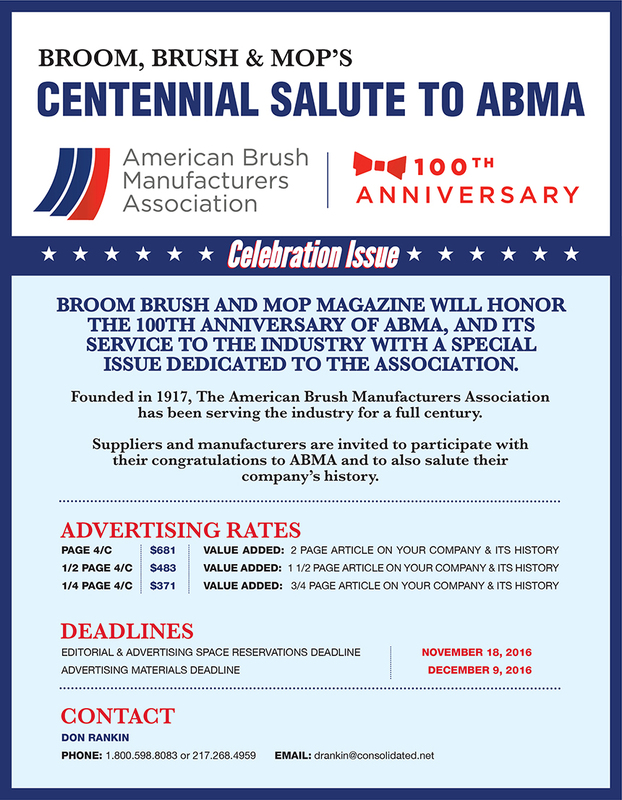 For the first five months of 2016, the average price per brush back was 45 cents, down 1 cent from the average price for the first five months of 2015. The import total of metal handles during May 2016 was 3 million, up 36 percent from 2.2 million for May 2015. During the first five months of 2016, 12.3 million metal handles were imported, up 12 percent from 11 million for the first five months of 2015. During the first five months of 2016, China exported 5.3 million metal handles to the United States, while Spain sent 5 million and Italy shipped 1.3 million. The average price per handle for May 2016 was 82 cents, down 15 percent from 96 cents for May 2015. The average price for the first five months of 2016 was 91 cents, down 5 percent from the average price for the first five months of 2015 of 96 cents. The United States imported 624,437 brooms of broom corn valued at more than 96 cents per broom during May 2016, down 5 percent from 656,638 for May 2015. During the first five months of 2016, 3 million brooms of broom corn were imported, the same as for the first five months of 2015. The average price per broom for May 2016 was $2.65, up 1 percent from $2.62 for May 2015. The average price per broom for the first five months of 2016 was $2.54, down 1 percent from the average price for the first five months of 2015 of $2.57. the first five months of 2015. 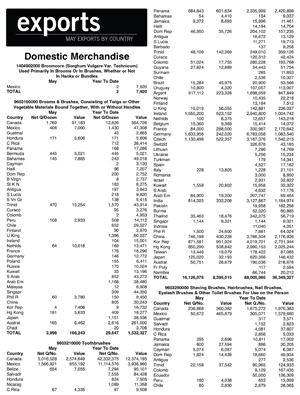 Sri Lanka exported 853,525 brooms and brushes to the United States during the first five months of 2016, while Canada sent 570,103. The average price per unit for May 2016 was $1.05, up 1 cent from the average price for May 2015. The average price for the first five months of 2016 was $1.12, up 5 percent from $1.07 for the first five months of 2015. The United States imported 100 million toothbrushes in May 2016, up less than 1 percent from 99.8 million imported in May 2015. During the first five months of 2016, 472.5 million toothbrushes were imported, up 14 percent from 415.9 million imported during the first five months of 2015. China sent 346.4 million toothbrushes to the United States during the first five months of 2016. May 2016 imports of hairbrushes totaled 4 million, up 3 percent from 3.9 million for May 2015. During the first five months of 2016, 17.8 million hairbrushes were imported, up 4 percent from 17.1 million for the first five months of 2015. China shipped 17.3 million hairbrushes to the United States during the first five months of 2016. The average price per hairbrush was 25 cents during May 2016, the same as the average price for May 2015. For the first five months of 2016, the average price per hairbrush was also 25 cents, down 7 percent from the average price for the first five months of 2015 of 27 cents. The United States imported 7 million shaving brushes in May 2016, up 49 percent from 4.7 million imported in May 2015. During the first five months of 2016, 31.9 million shaving brushes were imported, down 22 percent from 40.8 million imported during the first five months of 2015. China sent 21.1 million shaving brushes to the United States during the first five months of 2016, while South Korea shipped 3.5 million. U.S. companies imported 22.3 million paintbrushes during May 2016, down 4 percent from 23.2 million for May 2015. Paintbrush imports for the first five months of 2016 were 104.8 million, up 13 percent from 93.1 million for the first five months of 2015. China shipped 99.1 million paintbrushes to the United States during the first five months of 2016. The average price per paintbrush for May 2016 was 34 cents, the same as for May 2015. The average price for the first five months of 2016 was 31 cents, down 9 percent from 34 cents for the first five months of 2015. The total import of upright brooms for May 2016 was 1.5 million, up 25 percent from 1.2 million for May 2015. During the first five months of 2016, 7.7 million upright brooms were imported, up 28 percent from 6 million imported during the first five months of 2015. China sent 6.9 million upright brooms to the United States during the first five months of 2016. The average price per broom for May 2016 was $1.36, up 6 percent from the average price for May 2015 of $1.28. The average price per broom for the first five months of 2016 was $1.32, down 7 percent from $1.42 for the first five months of 2015. Export totals for the first five months of 2016 were up in three categories outlined: toothbrushes, shaving brushes and paintbrushes, compared to the first five months of 2015. In May 2016, three categories outlined reported increases: shaving brushes, artist brushes and paintbrushes, compared to May 2015. The United States exported 3,998 dozen brooms and brushes of vegetable materials during May 2016, down 59 percent from the May 2015 total of 9,776 dozen. Exports of brooms and brushes of vegetable materials during the first five months of 2016 were 29,647 dozen, down 17 percent from 35,865 dozen for the first five months of 2015.
and brushes to Canada during the first five months of 2016. During May 2016, the United States exported 16.1 million toothbrushes, down 14 percent from the total recorded in May 2015 of 18.8 million. During the first five months of 2016, 88 million toothbrushes were exported, up 27 percent from 69.2 million exported during the first five months of 2015. The United States exported 42.3 million toothbrushes to Canada, and 11.1 million to Mexico, during the first five months of 2016. The average price per toothbrush for May 2016 was 52 cents, up 21 percent from 43 cents for May 2015. The average price per toothbrush for the first five months of 2016 was 41 cents, down 18 percent from 50 cents for the first five months of 2015. The United States exported 1.7 million shaving brushes during May 2016, up 21 percent from 1.4 million for May 2015. During the first five months of 2016, 6.8 million shaving brushes were exported, up 26 percent from 5.4 million for the first five months of 2015. Brazil imported 2.5 million shaving brushes from the United States during the first five months of 2016, while Canada received 1.6 million. The average price per shaving brush for May 2016 was $1.20, up 20 percent from the average price for May 2015 of $1. The average price for the first five months of 2016 was $1.31, up 2 percent from $1.28 for the first five months of 2015. May 2016 exports of artist brushes totaled 949,800, up 1 percent from 935,881 for May 2015. During the first five months of 2016, 3.8 million artist brushes were exported, down 21 percent from 4.8 million for the first five months of 2015. Canada received 2.5 million artist brushes from the United States during the first five months of 2016, while the United Kingdom imported 419,222. The average price per artist brush was $2.82 during May 2016, up 18 percent from the average price for May 2015 of $2.40. For the first five months of 2016, the average price per artist brush was $3.52, up 36 percent from the average price for the first five months of 2015 of $2.59. The export total of paintbrushes during May 2016 was 192,405, up 16 percent from 166,438 for May 2015. During the first five months of 2016, 1.4 million paintbrushes were exported, up 92 percent from 730,868 for the first five months of 2015. Canada imported 859,711 paintbrushes from the United States during the first five months of 2016, while the United Kingdom imported 195,006. The average price per paintbrush for May 2016 was $7, down 41 percent from $11.80 for May 2015. The average price for the first five months of 2016 was $5.01, down 59 percent from $12.31 recorded for the first five months of 2015. Shown, left to right, are Wöhler representatives Egbert Brottka, Dr. Katrin Wöhler, Wolfgang Stark and Matthias Peveling. 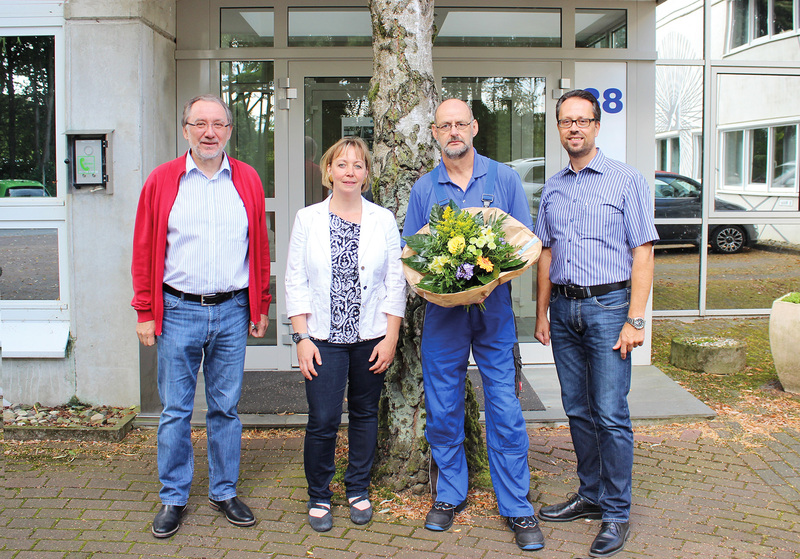 The company management of Wöhler Brush Tech GmbH and Wöhler Holding GmbH, together with colleagues, recently honored Wolfgang Stark for his 45 years of service to the brush machinery manufacturer. “Stark started his career in 1971 with a machinist apprenticeship at Wöhler. In the following four and one- half decades, he has experienced the development and expansion of the company, as an important member of the Wöhler team,” said the company. at Wöhler Brush Tech GmbH, honored Stark with a presentation. Visit www.bt.woehler.com for more information. national sales manager of its Clean-fit division. In his new position, Kirkland supervises sales and support for Clean-Fit Products, a division of the Mill-Rose Company. Products within the division include the Blue Monster® line of professional-grade brushes, abrasives, sealants and hand tools. Kirkland has 20-plus years of sales and management experience in the plumbing/heating/cooling industry. Clean-Fit Products serve contractors in the plumbing/heating/cooling industry offering professional-grade brushes, abrasives, PTFE thread sealants and specialty tools. The Mill-Rose Company is a U.S. manufacturer of twisted-in-wire brushes used in industries throughout the world. Mill-Rose is a family-owned organization, now in its third generation. Visit www.cleanfit.com and www.millrose.com for more information. 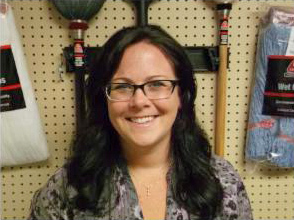 Nexstep Commercial Products has hired Sarah Ulrich to work in its Paxton, IL, customer service department. She was previously employed for 16 years in the grain industry. Ulrich is married with two children, and is also a health and fitness coach. She can be reached by phone at 217-379-2377 (Ext. 212), by fax at 217-379-9901, or via email at sarah@ocedarcommercial.com. Visit www.ocedarcommercial.com for more information. Pictured, left to right, are Robert Davis, vice president of sales & marketing, Loos & Co., Inc.; Matt McCooe, CEO of Connecticut Innovations; Kazem Kazerounian, dean and professor of mechanical engineering, UConn; Hadi Bozorgmanesh, Ph.D., co-executive director, UConn Entrepreneurship and Innovation Consortium; U.S. Congressman Joe Courtney; Bill Loos, CEO of Loos & Co., Inc.; Kathy F. Rocha, Entrepreneurship and Innovation Consortium, UConn; and, Michael Accorsi, senior associate dean, School of Engineering, UConn. “Loos & Co., Inc., is the first business to be selected to participate in the Quiet Corner Innovation Cluster (QCIC). The QCIC was created to enable economic growth in rural Eastern Connecticut, otherwise known as Connecticut’s Quiet Corner,” said the company. Representatives of The Quiet Corner Innovation Cluster (QCIC) said it will create an innovation network to drive economic development in rural Eastern Connecticut, comprised of New London, Tolland, and Windham counties. According to the release, Connecticut’s Quiet Corner has been adversely impacted by high unemployment rates, stemming in large part from the stagnation or demise of legacy manufacturers. The QCIC is able to use the University of Connecticut's (UConn) science and technology resources, including innovation and entrepreneurship infrastructure through the UConn Technology Park. Loos & Co., Inc. is a manufacturer of military specification aircraft cable and aircraft cable assemblies. The company has over 50 years of experience in the cable industry and supplies flight control assemblies to aircraft manufacturers. company’s roofing ceremony in Oettingen, Germany. Lessmann GmbH recently celebrated the completion of the company’s new high rack storage facility in Oettingen, Germany. Company owners Jürgen and Dieter Lessmann led the celebration with a “roofing ceremony,” a traditional German custom. All involved partners, companies and employees working on the building site, as well as neighbors, were invited. In a short address, Jürgen Lessmann discussed the construction progress. He said one challenge was the installation of a tank for the sprinkler system, which is under the new hall. He said the tank was necessary due to stricter fire protection requirements. Jürgen Lessmann thanked all involved companies for their expertise during the construction process as well as area residents for their patience with the additional noise and dirt. He also thanked Lessmann employees who worked under uncomfortable conditions caused by the construction process. Following welcoming remarks by the mayor of Oettingen and the architect in charge, the construction supervisor gave a traditional speech which is typical for a roofing ceremony. He discussed the long collaboration between his company and Lessmann, and said that the brush manufacturer has demonstrated its commitment to the future with new machinery and buildings. Following the official ceremony guests were treated to a meal. Lessmann is a producer of tools used for surface finishing, and offers approximately 10,000 products. Visit www.lessmann.com for more information. Osborn, a supplier of finishing products, has introduced a new line of abrasives. The line includes depressed-center grinding discs, cut-off discs and flap discs. All products are produced in Osborn’s new manufacturing facility in Germany. “Combining the best materials and process excellence with designs and formulations developed by Osborn’s research and development engineers, Osborn’s grinding discs, cut-off discs and flap discs are especially recommended for users 'who demand the most' from their abrasives products,” said the company. Osborn’s new depressed-center grinding discs, cut-off discs and flap discs are offered in 4 and 1/2- to 7-inch diameters and include aluminum oxide, zirconia and ceramic abrasive types. The new line includes 56 product SKUs. Visit www.osborn.com for more information. “With Wooster's improved Painter’s Comb™, professionals and consumers can thoroughly care for and maximize performance of their favorite Wooster paintbrushes,” said the company. The Wooster Painter’s Comb features a shorter handle. Wooster said the comb combines the benefits of a traditional pin-style comb with a powerful, yet gentle, wire brush. 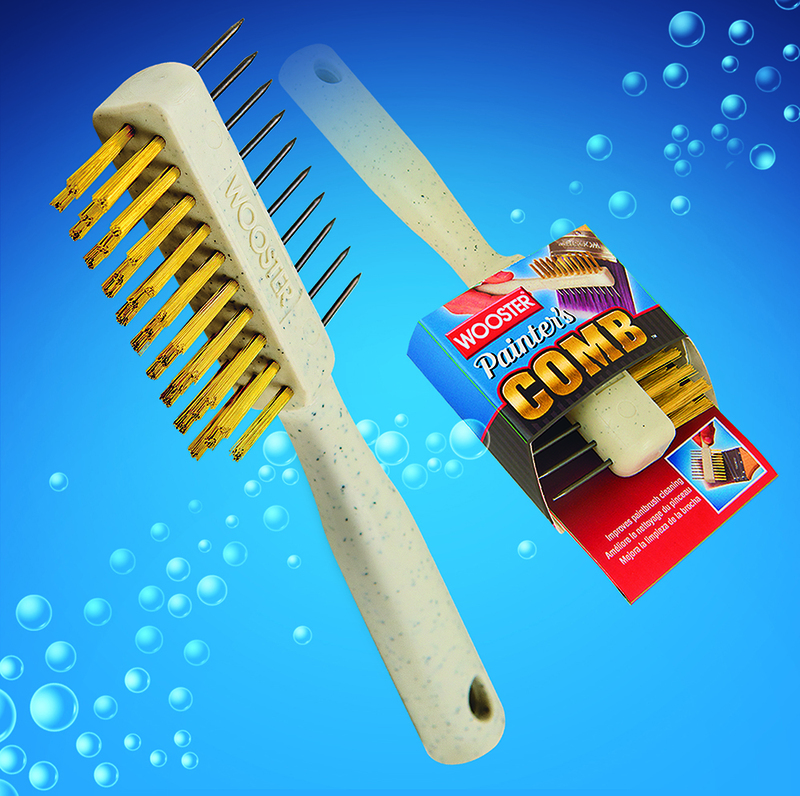 The Wooster Painter’s Comb features new, full-color packaging. Based in Wooster, OH, the privately held company has 550 employees, and produces more than 2,000 products for both professional and DIY painters. Visit www.woosterbrush.com for more information. New Products To Rejuvenate Polishing And Buffing Pads. “Motorsport enthusiasts have long known that well-cared-for tools last longer. 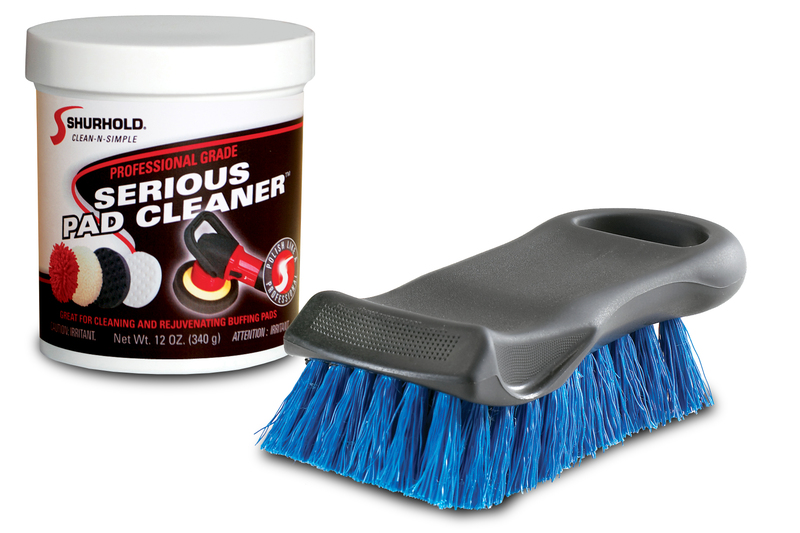 Shurhold Industries now offers a pair of products to clean and rejuvenate polishing and buffing pads for maximum effectiveness,” said Shurhold. Serious Pad Cleaner works on wool, cotton, foam, microfiber and blended materials. A 12-ounce tub will make 20 to 24 gallons of solution. The mixture will last up to a week.